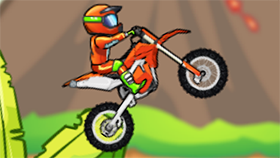 Welcome to Extreme Bikers, an interesting physics and driving video game, developed and published by OrangeGames. The game puts you in a cool role of a driver. You will drive a mountain bike. Your task is to overcome the obstacles along the way, avoid the deadly dangers, and run to the destination as fast as possible. 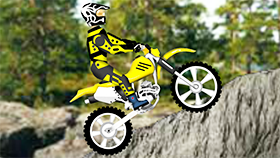 Extreme Bikers has 12 levels, with each level being a touch challenge for you. 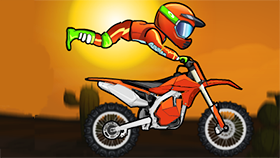 At each level, you will experience many unique elements like physics, speed, stunts, and more. You can run on the balloons, use the ramps to fly through holes filled with spikes, or you can do the nice tricks to show off your driving skills. After completing a level, you will have up to 3 stars. The number of stars will depend on your completion time. Each time you complete a trick, you will be deducted for 1 second. Note that you must control your vehicle carefully because you will face many dangerous traps. Are you ready to drive your mountain bike yet? Good luck and have fun! Hit the left arrow keys to tilt left. Hit the right arrow keys to tilt right. Hit the up arrow keys to go forward. Hit the down arrow keys to go backward. Do flip as soon as you can. Control your character carefully to avoid being overturned. If you want to enjoy Extreme Bikers Unblocked for free in a smoothly way, our site Freegames66.com is the right place for you. Here we offer a nice user-interface which helps you have a great gaming experience. Moreover, we open 24/24 so you can access Freegames66 anywhere and anytime you want! 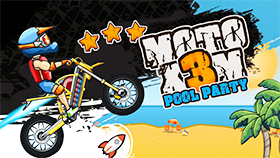 Now, enter Extreme Bikers Unblocked, do the tricks to show off your driving skills and get to the finish line safely!